Month of Modern – a Success by all Measures! Month of Modern was a huge success due to the hard work of a number of people, but it was also a success because it fulfilled a need. Month of Modern started as an idea to celebrate the 25th anniversary of HMH Architecture + Interiors. Kate Bailey of Annabel Media grew MoM into something much more significant. All events were sold out and over 400 people participated in the final event. This may be a record for an architectural celebration! A number of people congratulated me on Month of Modern. What surprised me the most is that there were many requests for more academic forums similar to the panel discussion held on October 2nd. This may be the result of the public being tired of mediocre architecture. People are interested in what makes a quality built environment. This coming April is architecture month across the country. The American Institute of Architects is planning events in Boulder for the Month of April. HMH Architecture + Interiors will be hosting an event for Architecture Month and hope others feel empowered to organize his or her own event in April. 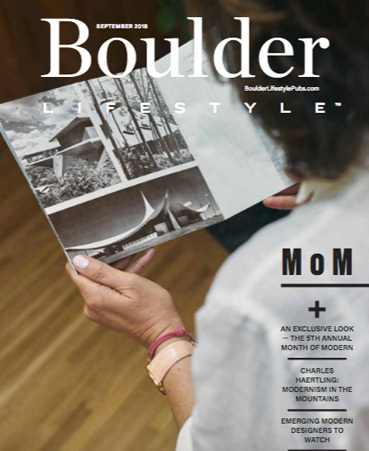 Thank you to Kate Bailey, Stephanie Bingham, Jennifer Egbert, Modern in Denver Magazine, Audi Bouder, LaDolce Events and the 40+ additional sponsors for making MoM possible. By stephanie@hmhai.com|2014-11-18T16:41:38+00:00November 19th, 2014|Architecture, Month of Modern|Comments Off on Month of Modern – a Success by all Measures!